Dressing tables are really essential in our bedrooms. You need to see yourself every now and then, especially when you are heading out. Getting the right one which suits your mood and style can be tricky. Also, you have to keep in mind that your dressing table doesn’t take up the entire space of your bedroom. These are beautifully created pieces of dressing table. Found mainly in white colors. 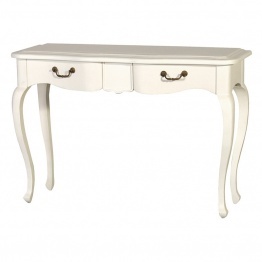 French dressing tables add a touch of romance to your bedroom. Of course, you need a little more space than usual for these. Created with carved legs and beautiful designs bordering the mirror. You can also opt for the ones that have drawers along with it. There will be ample space to keep things on the table as well in the drawers. Decorate it further with flowers on one side. Get this one if you want an absolute beautiful option. 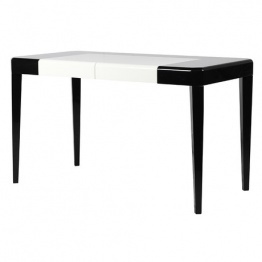 The main criteria of this type of dressing tables are that they have the right mirror. Most people use dressing tables for the purpose of mirrors. And, when they have it right, then there is nothing to look further. 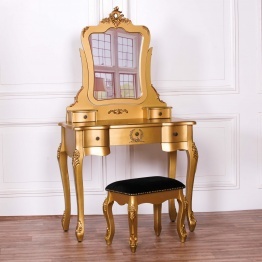 These dressing tables are very useful as you can view yourself fully in front of them. The mirrors are usually oval in shape though you can choose this according to your choice. There is also the possibility of attaching the mirror separately. Dressing tables made to suit the look of the rest of the room is called painted dressing tables. You can get them as per your requirements. It is not a problem if you have a choice of color that is not common to what we have. We are going to customize the dressing table as per your needs. You can coordinate the stool and the structure of the dressing table as per your choice of color. This type of dressing tables looks great in the bedrooms. You can match or keep a contrasting color in the room. 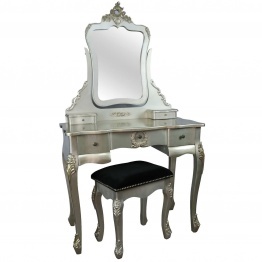 Venetian styled dressing tables are very classy. You would find gorgeous detailing on the feet of the dressing tables. There are mirrored panels which give an edgy look to the whole piece of furniture. Wherever you keep it, it is going to turn the overall look of the room into something amazing. It brings on the perfect look of the room. There are drawers which are very useful to store makeup or other essential everyday things. Here the dressing tables are mainly found with mirrors. The building up of these dressing tables is somewhat different. It is because the mirrors can be detached from the main structure of the dressing tables. These are utility dressing tables. You can customize these dressing tables according to your requirements. You can build as many as drawers as possible. 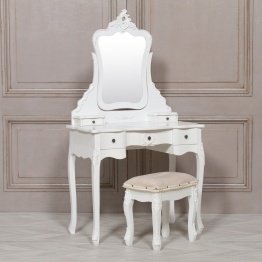 There are separate stools that are perfectly designed to go with the dressing table. Here are some of the dressing table types that are available with us. Get in touch with us to book your choice!